Most of the time we start our day with a grunt; dragging ourselves out the door still half asleep, beforeeither going through the motions of our day without even noticing what we’ve done or stressing about every useless detail. Let’s face it, life’s no fun when you’re not really living it. But practising something as simple as mindfulness CAN change all that. Here’s 10 top tips on how to use the expert's favourite technique to clear your mind and transform your life. 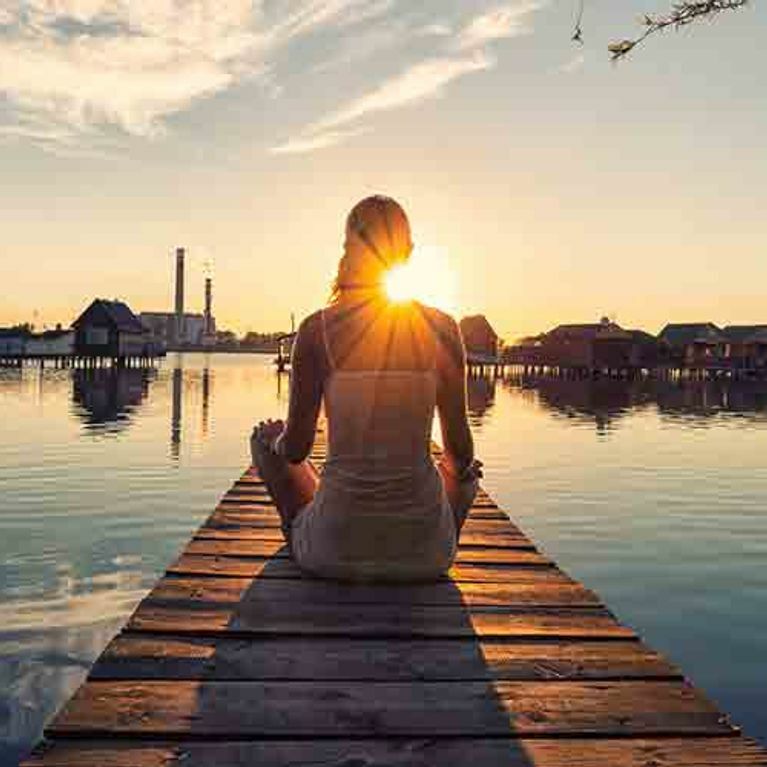 Although the concept of mindfulness sounds pretty complex, all it really is, is the practise of connecting the body and mind by harnessing the present moment. Simple things like making the effort to appreciate what’s happening around you, slowing down and really thinking about the things you are doing, are all exercises in mindfulness and are said to have the power to completely change your experience of life. This isn’t just another wellness fad either, mindfulness has been a technique for stress reduction for centuries and is actually recommended by the NHS as a tool for treating anxiety, depression and stress disorders. Dr James Arkell, consultant psychiatrist at Nightingale Hospital says, “Mindfulness is increasingly being recognised as a treatment for a number of mental health problems; however it is particularly useful for stress reduction and in people who have chronic or recurrent depression. “It is different to other treatments as it enables patients to realise what makes them vulnerable to downward mood spirals and helps them to understand what depression is. Although the concept of ‘connection between mind and body’ is something you might hear in your morning yoga class then forget about for the rest of the day, actually when you think about it, having the ability to control your thoughts is a technique that many of us could really do with learning. Particularly, as Dr Arkell says, as you can start to recognise troublesome thought patterns of stress and anxiety, before they spiral. Apps and books are a great way to help you get started with a few basic mindfulness exercises. The MindApp is a three minute guided meditation to give the listener breathing space and a little bit of that much need ohm in their life. Take a moment out of your day to simply connect and be present within. Acknowledging thoughts, feelings and bodily sensations. You’ll be surprised how calm you’ll feel after doing this for only a few minutes a day. When you’re rushing back from work or running to get inside from the rain, take a moment to take in what’s actually happening around you. Ask yourself: Do you really need to rush back home? Is the rain really all that bad? Take things slowly for once and start embracing life as it is. The satisfaction is incredible. Health & Energy Expert & Author of Energise You, Oliver Gray says, “Try to be really present in the shower, by focusing on all your senses, how the water feels on your body, what the water looks running over your body and the smell of your shower gel. “You will notice by taking your shower in this way you won’t spend your time thinking about the past or future, instead you will be in the moment.” And that, my friends, is what most of us forget. Live for the moment. Put your commute to better use! “During your journey focus on the beauty of nature - this could be a flower (even one outside a flower shop!) or a tree. Also take in the people and colours around you,” says Oliver. Do this and you will start to appreciate life’s simple pleasures. Oliver recommends choosing a healthy high-energy breakfast to kick off the day. “For example, combine oats, chia seeds, goji berries and blueberries with almond milk. This scrummy breakfast is packed with all the nutrients the body needs.” Being mindful is a mind body based experience so without adequate food, being mindful won’t come so easy! You can even check our tips on how to eat mindfully. Become mindful of your inner energy while on the bus, train or tube. “Sit in an upright position, relax your muscles and focus on the air going in through your nose and out through your nose,” says Oliver. ​Suddenly within minutes all life’s tribulations will be far from and your body will immediately relax, completely free and composed. Have you ever had a conversation with someone first thing in the morning and thought, ‘They were so lovely!’? Well, a lot of us are really but the problem is, we just don’t give enough. Has someone made you smile today? “Tomorrow give this experience to the first person you speak with, really listen to what they say and become completely absorbed by the person and the interaction you have with them,” Oliver suggests. If we all started being more mindful like this the world would be a completely different picture. It's cliche, we know! But without going to much into it, we’ll just say take what life gives you and always stay open to the possibility of good things. A little bit of hope is actually all you need in life. Stay positive! Being mindful is something you can do anywhere, anytime. Once you get the gist with a few practices they can be built into your day and practiced on the tube, at your desk, in the park - pretty much, anywhere! Today, choose to be mindful. Have you practiced mindfulness? Tweet us @sofeminineUK! Can You Really Learn How To Be Happy? Apparently, You Can!